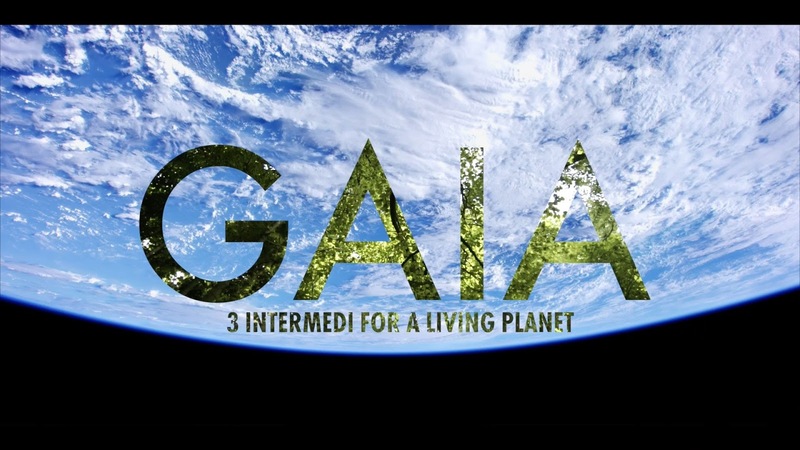 Brighton Early Music Festival's (BREMF) Gaia: Three intermedi for a living planet, was presented at St Bartholomew's Church, Brighton on Saturday 12 November 2016. 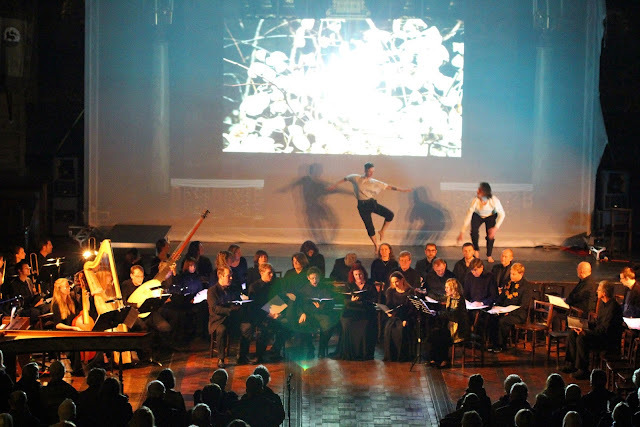 Inspired by the festival's 2014 production of the Florentine Intermedi of 1589, it was a theatrical event devised and directed by Deborah Roberts, Gaia which featured music by Josquin des Pres, Antoine Brumel, Claudio Monteverdi, Orlando di Lasso, Giaches de Wert, Giammateo Asia, Marco di Gagliano, Maurizio Cazzati, Lodovico Agostini, Heinrich Isaac, and Giovanni Gabrieli, performed by the BREMF Consort of Voices (director Deborah Roberts), Onde Sonore (Deborah Roberts, Christina Thaler, Natasha Stone, Matthew Pochin, Dominic Bevan, Andrew Robinson), the Lacock Scholars (director Greg Skidmore), the BREMF Community Choir (director Andrew Robinson), the English Cornett and Sackbut Ensemble, Claire Williams (harpsichord, organ), Aileen Henry (harp), Toby Carr (chitarrone), and Alison Kinder (bass viol). Just as the festival's production of the Florentine Intermedi had been interpreted via modern visuals, so Gaia featured featured performances from Anonymous 2 Dance (Sebastian Blue Pin, Tom Shale Coates), and Laura Shipsey (yoga), film by Zen Grisdale (with extra footage from Sid Dult and Oliver Martin), lighting and projection by Pitch Black, costumes by Gladrags Community Costumes Trust. Each intermedio took a particular theme, The Earth's Core, The Earth's Surface and The Skies and the Heavens, and within this each had two parts, the first purely descriptive, the second mythical and allegorical. Whilst elements were staged (the extracts from Monteverdi's L'Orfeo and Marco di Gagliano's La Flora), much of the presentation combined imaginative lighting with Zen Grisdale's spectacular film of the earth's natural features, the film being projected onto a huge screen erected at the East end of the church. It was perhaps unfortunate that the opening section featured both some of the most spectacular footage and the most striking music, making it difficult for subsequent sections to live up to it. 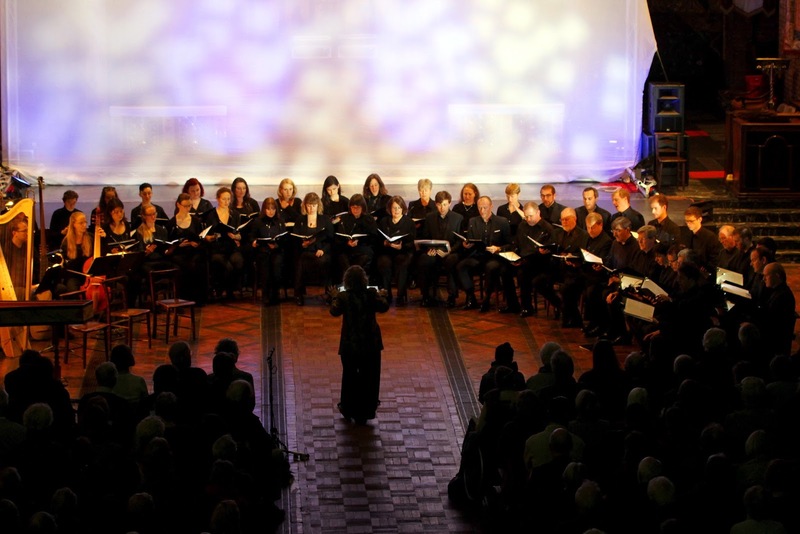 For the Prologue: The emergence of complexity we saw fractals and heard Qui habitat the 24-part motet by Josquin de Pres (1450-1521) in which the combined choral forces filled the vast spaces of St Bartholemew's Church. Then for Intermedio 1 - Earth's Centre we had the Kyrie and Gloria from the 12-part Missa et ecce terrae motus (the Earthquake Mass) by Antoine Brumel (1460-1620), accompanied by dramatic film footage of underground caverns, rift valleys and of course volcanoes, and then a staging of Act 3 of L'Orfeo by Claudio Monteverdi (1567-1643), and we also heard a sinfonia by Cristoforo Malvezzi (1547-1599) from the Florentine Intermedi of 1589. For Brumel's mass the singers from BREMF Consort of Voices, the Lacock Scholars and members of Onde Sonore were joined, in true Renaissance fashion, by members of the English Cornett and Sackbut Ensemble, all conducted by Deborah Roberts. The result was a thrilling evocation both visual and aural, with Brumel's mass complementing the images. Inevitably, with so many performers in an acoustic the size of St Bartholemew's, the detail was often fuzzy, but the total effect was striking and it was very much a total effect, sound and sight..
Act Three of Monteverdi's L'Orfeo was staged by having the characters danced and mimed, by Sebastian Blue Pin (Speranza), Tom Shale-Coates (Orfeo) and Mike Hanna (Caronte), whilst the singers, Matthew Pochin (Orfeo), Christina Thaler (Speranza) and Andrew Robinson (Caronte) sang from the sides. Pochin made a fine, lyrical voiced Orfeo so it was a shame that the extracts performed did not include his great showpiece, Possente spirto. Thaler was a slimly elegant voice Speranza, and Robinson a strong Caronte though he voice lacked the ideal darkness. The dancing was very evocative, and created a real dramatic context for the music, it was an idea which could perhaps be extended, especially as Sebastian Blue Pin is a BREMF regular as they sing in the BREMF Consort of Voices. Intermedio 2 - The Earth's Surface started with madrigals on the subject of Spring and rebirth: mountains, meadows and seas by Lasso, Monteverdi, Wert and Asola. The first, Orlando di Lasso's Hor che la nuova e vaga primavera was sung by the BREMF Consort of Voices. Whilst the group made a lovely noise, the use of so many singers (over two dozen) gave the piece a strongly choral sound. However this was followed by Wert's Questi odorati fiori and Usciva omai dal molle e fresco grembo, and Asola's In una verde piaggia in beautifully evocative performances by the six singers of Onde Sonore, their refined elegant sound bringing a clarity of texture to the pieces even in the large acoustic. The gods and spirits of the earth were celebrated in the staging of a scene from La Flora by Marco da Gagliano (1582–1643). La Flora is an opera jointly written by Gagliano and Jacopo Peri for Florence in 1628. We heard two scenes from the opera. 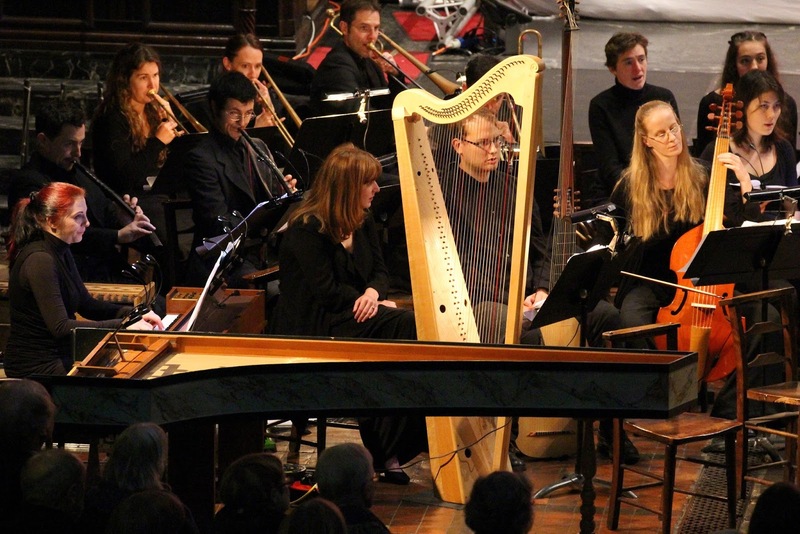 In the first Amor (Nara Clapperton), who has lost his bow having had it stolen by Mercury whilst he was asleep, is mocked by the god Pan (Matthew Pochin) and a chorus of Satyrs (BREMF Community Chorus). In the second, the complex events of the opera are resolved, with Dominic Bevan as Zephyrus, Christina Thaler as Flora, Duncan French as Lirindo, Agata Rybicka as Corilla, Natasha Stone as Berecynthia, Elizabeth Kelly as Venus and Nara Clapperton as Cupid. The staging, though effective, had something of an element of end of term hi-jinks about it, and felt in need of more stage rehearsal time. But it was lovely to hear this music brought to life on stage. In between the two scenes from La Flora there was an interlude dealing with the breezes, and the germination of the flowers, with Monteverdi's Come dolce hoggi l'auretta sung by members of Onde Sonore, then instrumental music by Maurizio Cazzati accompanied a striking yoga sequence by Laura Shipsey. The final intermedio dealt with the skies and the heavens. First a group of madrigals on the subject of birds and skies, with Wert's Vezzoso augelli, Monteverdi's Dolcissimo uscignolo and Vago augelleto and Agostini's Quando l'ira del cielo with performances again divided between the BREMF Consort of Voices and the Onde Sonore. This sequence ended with the lovely Noi che cantando by Malvezzi, another piece from the original 1589 intermedi. Finally we heard from the Queen of Heaven herself, with a lovely performance of Heinrich Isaac's large scale motet Angeli archangeli by the Lacock Scholars conducted by Greg Skidmore, and then all the performers gathered for a striking rendition of Giovanni Gabrieli's Regina Coeli. In her programme note, Deborah Roberts talked about the wealth of material that could have been selected for performance, and I felt that a little more pruning would not have gone amiss. The evening lasted two and a half hours, including interval, which was a little too long especially as the most spectacular things came first. The logistics of getting the large numbers of performers on and off stage, sometimes meant that there were awkward gaps between pieces. There was also an element of needing to find suitable vehicles for each of the BREMF performing groups. This is inevitable with a festival like BREMF with an admirably strong community base, something which they can rightly be proud of. Overall Gaia was a remarkable achievement; a superb blending of staging, technology and music. The visuals of Zen Grisdale's film were very striking and would have been absorbing on their own, but formed a highly effective complement to the music.